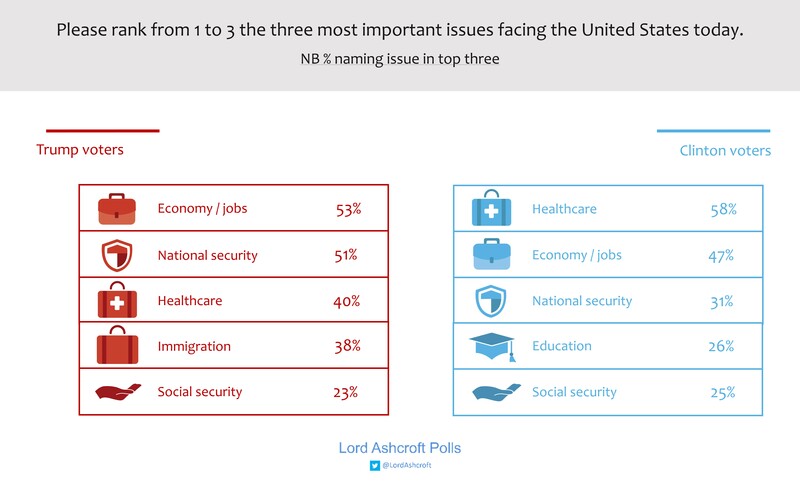 Asked to name the most important issues facing the United States today, more than half (53%) of those who voted for Donald Trump named “the economy and jobs” in their top three – as did nearly as many of those who voted for Hillary Clinton (47%). And it is a priority on which they expect the president to deliver. Around eight in ten of those who voted for Trump expect him to have more impact than a typical president when it comes to “the economic situation in the US”, “creating jobs in the US” and, more specifically, “keeping jobs in the US rather than letting them go overseas”. In our research during the campaign, we found that many of Trump’s supporters did not take his plan to build a wall on the border with Mexico literally. Indeed, given a list of eighteen possible priorities for the new president in our new poll, “building a wall between the US and Mexico” was close to the bottom both for Americans as a whole and Trump voters in particular: “deporting those who are in the US illegally” was seen as a higher priority when it came to immigration policy. However, they did take his pledge to crack down on illegal immigration seriously, as this new research confirms. When it comes to “preventing illegal immigration in the US”, 82% of Trump voters expect him to have more impact than a typical president. For Trump, as for many Americans, preventing illegal immigration is a matter of national security. As I found in my polling during the campaign, one of the biggest fears for many voters – especially those in the Republican base – was that current immigration policy might be letting potential terrorists into the US. In the list of specific priorities for the president, Trump voters put “protecting the US from terrorist attacks” at the very top, as do Americans as a whole. The overwhelming majority of Trump voters want to see the end of Obamacare in its current form; what should happen after that is a more complicated question. Only just under a quarter of those who voted for the president said they thought the Affordable Care Act as it stands “should be repealed immediately, even if a new plan to replace it is not ready for immediate implementation”. A majority (57%) said they want to see Obamacare repealed “but not before another scheme is ready to take its place”. Constructing such a scheme in a way that pleases the people who put Trump in the White House (let alone those who supported Hillary Clinton, half of whom want Obamacare retained as it is) will be a colossal challenge. Only 17% of Trump voters, and a quarter of Americans as a whole, said they wanted to keep the Individual Mandate, under which everyone is required to buy some form of health coverage. But Trump supporters themselves think other elements of Obamacare need preserving: two thirds said insurance providers should still be required to cover pre-existing conditions, a majority said they should not be allowed to charge higher premiums based on gender, and just under half said children should still be able to stay on their parents’ insurance until the age of twenty-six. Whatever solution is arrived at, healthcare is one of the issues on which President Trump will be judged: half of all voters, including four in ten of his own voters, name it as one of the three most important questions facing America. Despite the importance placed on jobs and healthcare, our poll found that Americans put “maintaining good relations with allies” among the very top priorities for the Trump administration. This perhaps reflects the nervousness we found before the election among many voters – including Trump’s supporters – about the potential repercussions of the new president’s brand of diplomacy. Voters as a whole rated “relations between other countries and the US” as the area on which a typical president has the most influence, and most people (including three quarters of Trump voters and nearly half of Clinton supporters) expect the new president to have an even greater impact than most. Whatever his approach, more than four in five Trump voters anticipated that in four years’ time America would be “taken more seriously internationally” than it is today; more than three quarters Hillary Clinton’s voters thought the opposite. On specific international questions, most Trump voters thought US economic sanctions against Russia and the nuclear deal with Iran both should be and would be reversed during the Trump presidency. Most Clinton voters also thought this would happen – and that the US would withdraw from the Paris Climate Change Treaty – though only a small minority thought any of these would be a good idea. We also asked in more detail about Russia. Nearly six in ten Clinton voters (but only eight in a hundred Trump voters) said they believed “Russia took action to influence the presidential election, and this had a significant impact on the election result”. Those who voted for Trump were divided as to whether Russia tried to influence the election but had no significant impact (39%), or did not in fact take any significant action at all (32%). The subject of Russian interference has been the subject of a public row between the new president and America’s intelligence community. We therefore asked who people were more inclined to believe when it came to “claims about the actions of America’s enemies have taken or are planning to take against the US” – intelligence agencies like the CIA or NSA, or Donald Trump. Seven in ten Clinton voters said they would give more weight to the intelligence agencies (though one in five said they would trust neither); Trump voters said they would be more inclined to believe the new president, by 41% to 30%. As well as being taken more seriously internationally, more than eight in ten Trump voters expect America in four years’ time to be stronger, richer, fairer and, yes, “greater” than it is today. Only just over two thirds said the country would be “more united”, and this is the point on which Clinton voters most take issue: more than eight in ten said America will be “more divided”, and on these questions at least that is already the case: three quarters of them also say the US will be weaker, poorer, less fair and less great. It is clear why Trump’s supporters have such high expectations for his presidency. Asked how well he will do on a range of roles and attributes people might expect from the president, the thing at which they most expect him to excel is “making things happen and getting things done”, closely followed by “being able to lead a team” and “having a clear idea of what he wants to achieve”. Moreover, they believe these attributes and achievements will pay off. Seven in ten Trump voters said they expected him to be re-elected in 2020. Indeed, 41% expect him to go down in history as “a great president” – compared to 13% who think the same of George W. Bush and just 7%of Barack Obama. That is not to say he won’t face obstacles along the way, the biggest of which, as far as his voters are concerned, is likely to be “the mainstream media” (who also draw the ire of Democrats, as we will see below), closely followed by Congressional Democrats. As things stand, though, they do not seem to expect Republicans in Congress to put major barriers in the way of the president’s programme – indeed, when it comes to his mission of making America great again, they expect Congressional Republicans to be slightly less of an obstacle than “Trump himself”. How should Democrats deal with Trump – and what went wrong? However, this was not true throughout the Democrats’ voting coalition. Cosmopolitan Activists – the most politically active, committed and progressive segment of voters on the Democrat side – were much more inclined to oppose the Trump administration outright. When it came to the president’s nomination to the Supreme Court, Democrats were somewhat more ready to dig their heals in. Given a choice of two positions, just over four in ten thought that “if President Trump nominates a qualified candidate, Democrats in the Senate should confirm his or her appointment even if they don’t like some of their views, because it is important to fill the vacancy on the Court.” But the majority felt that “Democrats should refuse to confirm President Trump’s nominee if they don’t like his or her views, even if this means the vacancy on the Court remaining open for another four years.” Again, there were shades of opinion within the Democrat coalition – three quarters of Cosmopolitan Activists would be prepared to leave the seat open rather than confirm a Trump nominee whose views they did not like. As for the election result itself, who was to blame? For Hillary Clinton’s voters, the main culprits were the media, the Russians, and – most of all – the people. A majority (56%) said one of the three most important factors in Clinton’s defeat was “voters not understanding the issues that were at stake”; nearly half blamed “mainstream media not holding Trump to account” (47%), “Russian hacking” (45%), or “fake news” (45%). Just over a quarter (28%) said “her team ran a poor campaign”. They were nearly as likely to blame “misogyny” (19%) and “racism” (16%) as they were to say “she wasn’t a very good candidate” (20%).